When found this recipe on a friend’s blog I knew that they would be incredible by just reading it. I love nuts, but not everyone in my seminary class likes them. I left the nuts out on purpose. I knew that once these were in my kitchen I wouldn’t be able to resist the temptation to eat more than one. I decided to eat one, let Rick eat one or two and then take the rest to seminary this morning. 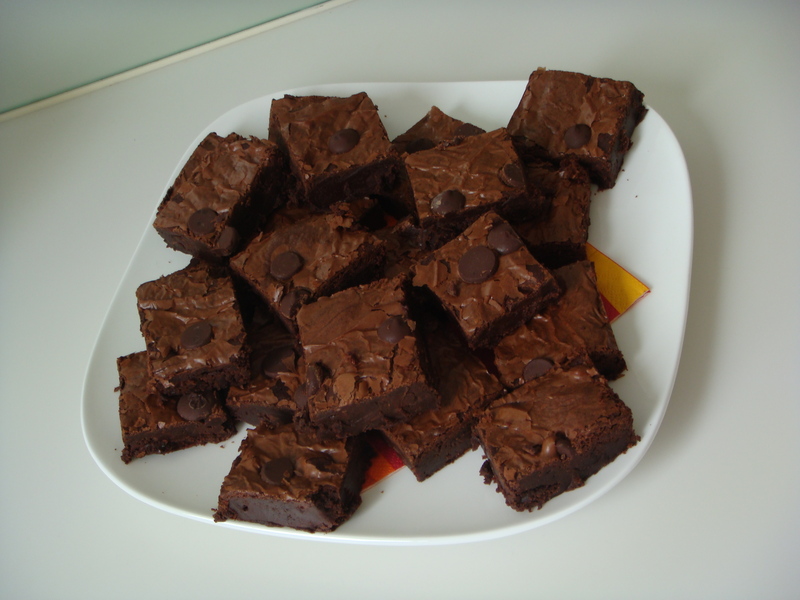 These are incredibly rich, moist, and oiishi (Japanese for delicious) brownies. I got up this morning and put a cute napkin on a plate and then piled on the brownies. Then I left them home! Yikes!!! I have a full 9″X13″ pan of brownies minus 2 3 sitting on a plate in the kitchen. They are actually taunting me. “We are soooo yummy come in here and eat some more of us!!! !” I am leaving now so I don’t have to listen to them until I figure out how to get rid of them humanely. Maybe I can give them away to friends in pairs, anymore than that could possibly kill someone since they are so rich. I am keeping the recipe, but it will be filed with the Nigella peanut butter and chocolate squares under recipes to make only when you have a crowd to share with. They really are delicious. Preheat oven to 350 degrees F. Grease a 9×13-inch pan. Melt butter in a saucepan. Add 1 3/4 cups chocolate chips and stir until melted. Add melted mixture to cocoa in a bowl and combine. Set aside. In a separate bowl, whip eggs with brown sugar. Mix flour with baking powder and salt. Add this dry mixture to egg/ brown sugar mixture. Mix in the butter-chocolate mixture. Stir in the remaining 3/4 cup chocolate chips and nuts. (Some nuts and chocolate chips may be saved to sprinkle on top of the brownies before baking.) Spread batter into a prepared pan. Bake for 25 minutes in a 350 degree F oven. Cool before slicing. Oh my goodness those sound divinely delicious! or is that devilishly =) I’ll have to try them AFTER I lose some more weight and give myself a treat! Thanks for all your comments on my blog – I know people read it, but they don’t comment much – I like a little feed-back =) Love to read yours!! I don’t dare try to make them. I will keep the recipe for when I need to take a treat. They sound too delicious to have around the house! I am printing it off as I type!